“I love Mayfly time.” I’ll say it again “, I love Mayfly time.” Its funny, lots of anglers will scoff, and say ‘even muppets can catch during duffers fortnight,’ and to an extent I agree. That said, this time of year brings its own challenges, it’s the nature of the beast. When conditions are pleasant, and the fish are free rising to an easily identifiable food source, more people hit the bank looking for action. Unless you are lucky enough to hit it at the right time, at the beginning of the mayfly season, things can get difficult. Some of the fish will fall easily to big busy mayfly patterns, I don’t disagree, but there are the more wily fish that wont touch anything they are not certain of, these are the fish that interest me. As the frantic mayfly hatches progress, these fish can become a real challenge. Regular readers of Fly Fishers’ Republic will have seen a piece last month covering the ‘steak and nut theory.’ There I look at mixed hatches and the need for a considered strategy. With that knowledge, you’ll know to carry some small CDC’s to the water, even during a Gree Drake hatch. Further to this: they (the big residents we are after) will still take mayflies, you just have to be canny in your approach. Long leaders, and I mean long, are the name of the game. The longest you can handle. Not only that, but long tapered leaders. I always advocate the use of tapered leaders, wont use anything else. But let’s face it, long leaders and big bushy flies can make life pretty interesting. Ok, let’s take a step back. 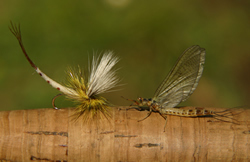 Imagine you are on the bank tackling up, you tie on a big realistic mayfly pattern like the Poly Ball Mayfly. Your leader is 15ft, tapered to 4lb straight out of the packet. This is great in theory, but you try and turn that bad boy over at range and you will fail. Sadly, physics, and gravity, just wont allow it. Bugger! So now we need to innovate. I have experimented a lot with big flies and tapered leaders, for just these situations. It’s a fact that the fish we all want to catch, the big ones, are a bit more clued up than the others, and may demand casting these big mayfly patterns at range. These ingredients are a sure fire way to twisted leaders, poor presentation, and frustration! Well, I think I have found the answer. Use a 12 or 15ft nylon or copolymer leader to a 10lb point, this ensures a smooth energy transmission at least to the end of this section of the cast. Now, using three turn water knots connect 6 inches of 8lb nylon, 6 inches of 6lb fluorocarbon, and finally 6 inches of 4 or 3lb fluorocarbon. This setup ensures the power of your cast transfers down the full length of the leader, turning over even the bulkiest of flies. Now all you have to do is remember to degrease the last 12 inches of tippet. If your tippet next to the fly lies on the surface of the water, your offering will get refused. OK, you know that right? It has to sink, while the rest of the leader floats. There are several sinkants on the market for this, I happen to use Orvis mud, but they’re all pretty similar products. If you can get hold of some Fuller’s Earth, you can always make your own. While I use Cortland nylon tapered leaders, to be honest, any reputable manufacturer’s leader will do. Make sure that the rear half of your leader is nylon, not fluorocarbon. Fluorocarbon will sink, and in slow water it will take your offering with it. For the tippet, the important part next to the fly, I will get specific. For the point, I use Fulling Mill fluorocarbon in 4lb, or if the fish are really spooky, 3lb. I have used most, if not all brands, and this is the stuff that works. Painful memories of fine trout lost, still haunt me from the time before I figured this out! Rod wise, I like a 9ft 6-wt for larger flies. With this I would team a WF6 line with a short front taper, like the Cortland Precision 444sl, or maybe a Rio Accelerator, perfect for this sort of fishing. If the river I’m fishing is wider that the norm, or longer casts are required, I would opt for a 9ft 6in 6-wt, I wouldn’t go above this. Ok, kit, and techno stuff out of the way, what about tactics? How can you catch more than the average angler? Wiggle it! Yeah, baby, Wiggle it! No, I’ve not gone simple! This is a tactic shown to me by Simon Kidd a few years ago. There is no doubt that it has accounted for fish that would not have otherwise taken my fly. It’s quite simple really. Once you have cast your fly, and it is drifting over your target, with a tight-ish line, wiggle your rod tip. This imparts movement to your fly, which makes it look like a natural caught in the surface film. If you watch the naturals that get caught in the surface of the water, you will see what I mean. Wiggling it makes all the difference, try it. 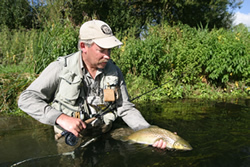 Another tip that Simon showed me is to fish two dries New Zealand style. Again, painfully simple. After you have attached your mayfly pattern to the end of your leader, attach a small CDC (remember the steak and nut theory ) to the hook bend. Use about 2ft of 3lb fluorocarbon. Its quite amazing to watch this set up in action. I have seen fish rise for the mayfly, fished in this fashion, only to drop back, and refuse it. They then see the smaller fly behind the may, and nail this with gusto. It works, give it a go! Leader Construction: For presenting bulky flies - Use a 12 or 15ft nylon or copolymer tapered leader to a 10lb point. Using three turn water knots connect further 6 inches of 8lb nylon, 6 inches of 6lb fluorocarbon, and finally 6 inches of 4 or 3lb fluorocarbon. This setup ensures the power of your cast transfers down the full length of the leader, helping turn over bulky flies.